Thu., Jan. 31, 2019, 5:41 p.m.
TORONTO – Prime Minister Justin Trudeau has often repeated that Canada’s most important relationship is with indigenous Canadians, a group that past governments had long sought to forcibly assimilate into the larger population. One of the pillars of his 2015 election was repairing that relationship, which he told the U.N. General Assembly was “Canada’s shame.” Since then, he has made a number of big promises to indigenous Canadians, including ending all long-term drinking-water advisories on reserves by 2021 and launching an inquiry into the country’s 1,200 missing and slain indigenous women and girls. This week, Parliament took its own step toward reconciliation: Robert-Falcon Ouellette, a Liberal Party lawmaker from Manitoba, spoke in the House of Commons in an indigenous language – and for the first time in Canadian history, indigenous words were simultaneously translated into English and French so they could be immediately understood in Parliament. Although simultaneous translation between English and French, Canada’s official languages, has been in place in the House of Commons since 1959, no such service has been available for those wishing to speak in the languages of the country’s original inhabitants in its main corridor of power. But last fall, Canadian lawmakers adopted a parliamentary committee report that recommended that translation services be made available for any lawmaker wishing to speak in one of the country’s more than 60 indigenous languages. That paved the way for Ouellette’s history-making moment. “It was important for me to use the language to show young indigenous people that we can be proud of our culture,” said Ouellette, who spoke Cree on Monday while discussing a motion proposing to establish a Dutch Heritage Day in Canada. According to the 2016 census, of the 1.6 million Canadians who reported having an indigenous identity, 260,000 of them said they could conduct a conversation in one of the country’s indigenous languages. Several of those languages are on the brink of extinction, in part because of past government policies that sought to eradicate their use. Those included the creation of residential schools where indigenous children were discouraged from, and punished for, speaking in their native languages. His government has also offered apologies for historical wrongs. Last week, his government officially apologized for the forcible relocation of a group of Inuit people nearly seven decades ago, which resulted in some of their deaths and the degradation of their culture. But critics say that progress on many of Trudeau’s promises has been sporadic and that some of his government’s policies are squandering goodwill and laying bare the limits of his rhetoric. This tension is perhaps most obvious in Trudeau’s attempts to balance defending the environment and protecting the rights of indigenous people with efforts to shore up the country’s energy sector by constructing pipelines. 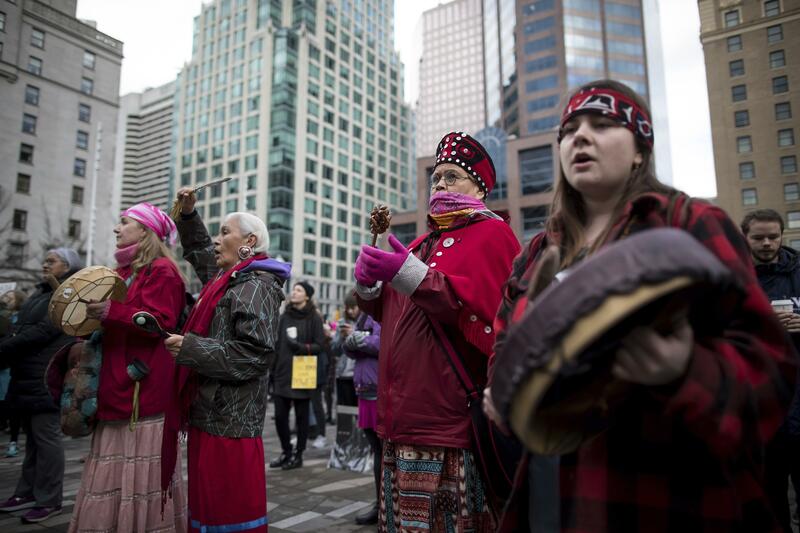 Last year, a federal court of appeals ruled that the government had failed to adequately consult with indigenous groups, and it halted the expansion of the Trans Mountain oil pipeline. The Liberal government insists that the pipeline will get built, which prompted Romeo Saganash, a Cree lawmaker, to say Trudeau doesn’t care about indigenous rights. Tensions rose again last month after members of the Wet’suwet’en First Nation in central British Columbia protested the construction of a $6.2 billion natural gas pipeline on their traditional territory. The Royal Canadian Mounted Police arrested 14 people after the Wet’suwet’en erected a checkpoint to block construction crews. “There will be no reconciliation in Canada unless and until there is a real nation-to-nation relationship where Canada respects our sovereign jurisdiction and returns a fair portion of our lands and resources back to us,” Pamela Palmater, chairwoman of indigenous governance at Ryerson University in Toronto, said in an interview. Published: Jan. 31, 2019, 5:41 p.m.